Half Price Patios specialises in a variety of patio structures to suit all types of outdoor living areas. 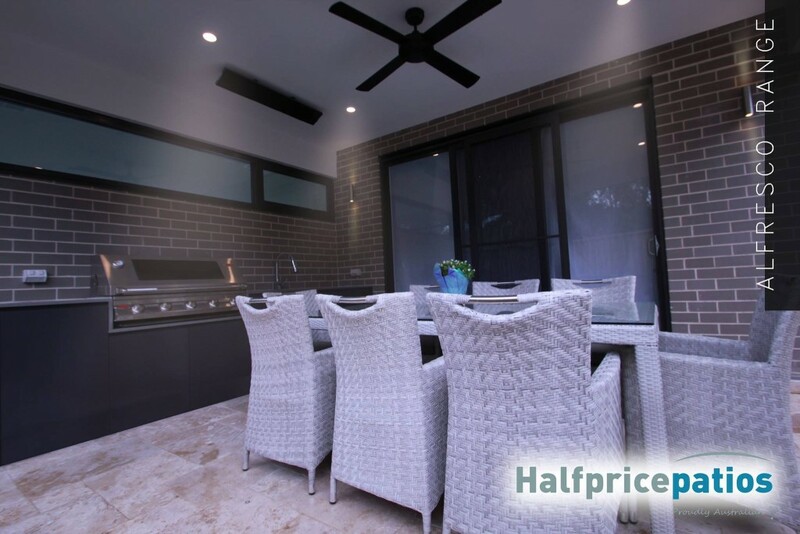 Half Price Patios now offers custom built al fresco areas to meet today’s modern living standard. Half Price Patios can transform your wasted or outdated outdoor area into the most elegant and prestigious al fresco. We can manage your project from the ground up including, concreting, floor tiling, roofing, columns, privacy screens and even your BBQ area. We can also prepare plans for approval. Call Half Price Patios to book in an experienced patio consultant. Half Price Patios will send out one of our many highly qualified patio consultants to go through the area with you and brew up many creative ideas. Your patio consultant will send you back some concept plans with fixed pricing. Half Price Patios will build your new exciting project and handover to you to enjoy. Half Price Patios will make the whole process as easy as possible for you. Half Price Patios are licensed builder and approved by HIA building association. So you can rely on us to give you the highest level of quality and customer service. Half Price Patios is the market leader in terms of products (including our Al Fresco Range) and service.